This is the fourth post in a series that is a review of the Original Young Life Leader Training Manual from 1942. 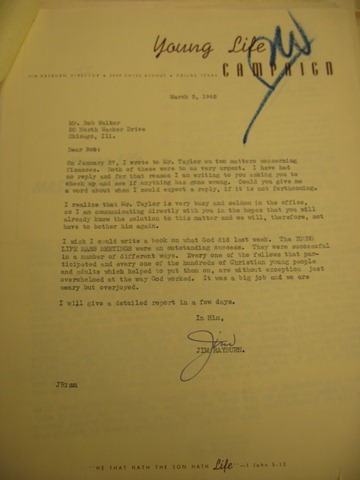 If you are interested, here is the link to the copy I made of the manual with a letter from Jim Rayburn. 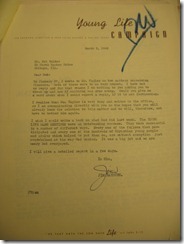 The Young Life “Campaign” was organized under a national board of directors, much as it is today. Under this board sits a local committee. Then there are field staff. At the time of this manual there were only five Young Life staff! The manual mentions that they were paid a salary each month, if the money came in that month! The staff was expected to keep a file of all club members. Weekly reports of attendance were to be sent in to the office for their records. The activities of the local Young Life area were to be centered around the Young Life club. The manual calls the club the “backbone”. But the manual teaches that the activities are not to be set in stone, but to flex with the changing needs. Interestingly enough it suggests that “more needs to be done”, which may include, “radio programs, street meetings, gospel teams, printed matter, and so on.” It may be that Jim Rayburn wanted to start a radio program to the unchurched as part of the ministry! We would be wise to keep our minds and hearts open to different opportunities in our day. The organization was also based on its doctrinal statement. One interesting part in this section is that the campaign motto was, “He that hath the Son hath life” (1 John 5:12). What a great motto! Its explicit focus on Jesus, life and having Him in your life is what Young Life is all about. This part of the manual also states it financial approach. It mentions that Young Life has three sources of support: “contributions of Young Life club members, club offerings, and the voluntary gifts of interested Christian friends.” I couldn’t imagine a offering at club, or money from club kids, but I guess that is how it started! 1) How do we benefit from a national board and local committee? 2) Early Young Life kept close record of each student and attendance. How might this help or hurt our effort now? 3) Is the Young Life club still the “backbone” of the ministry? 4) The manual suggests activities such as radio, street meetings and more. Brainstorm some activities that we have never tried in Young Life. Could any work? 5) What do you think of the original motto, “He that hath the Son hath life”? 6) How does Young Life relate to your local churches? I’ve looked EVERYWHERE on the internet for them and I can’t find them. I fixed the link on this page. Thanks Ryan! I hope you enjoy it.